A Riverhead woman is one of 14 people accused of dealing heroin in a network of drug rings that pumped about $3.6 million worth of drugs into Suffolk County, according to Suffolk County District Attorney Thomas Spota. “This is probably one of the most prolific operations [we] have seen in many, many a year,” Mr. Spota said at a press conference Wednesday morning. Prosecutors said 27-year-old Jacquelyn Cleary, working as an individual seller in the Hauppauge and Central Islip areas, picked up “52 sleeves” of drugs — branded under the name ‘High Octane’ and sold for $10 a piece — from accused Brooklyn kingpin Miguel Vicente during the 38 days investigators were actively monitoring the operation. The drug ring as a whole is believed to have been running over a year before it was busted. Ms. Cleary was convicted of drugs sales once before and twice sold drugs to undercover officers as part of the High Octane network — once on Feb. 6 and again on March 5, according to court documents. She also met with Mr. Vicente and an associate of his on March 1 to settle a “narcotics transaction,” the documents state. Mr. Spota claimed that Mr. Vicente used a pair of heroin addicts as “quality control” to test his drugs, and would overpack each bag of heroin to encourage his customers to buy from him. 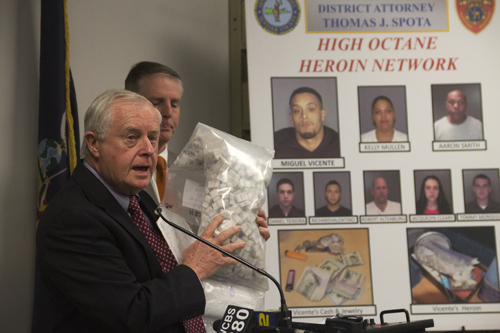 The bust comes about six weeks after county authorities arrested nine people in a drug ring that reportedly sold Hollywood-brand heroin up and down Route 58 in Riverhead for over a year. “Despite all of our efforts, high-quality heroin continues to flood into Suffolk County from New York,” Mr. Spota said. Also accused as masterminds in the High Octane ring were 57-year-old Aaron Smith and 27-year-old Kelly Mullen, a Holtsville couple who reportedly sold heroin out of their home — where 10 children were also living. The pair were arrested at a CVS Pharmacy, where officers found 4,500 bags of heroin in their car. If convicted of the top felony charge, Ms. Mullen, Mr. Smith and Mr. Vicente face up to life in prison. Mr. Spota said Ms. Mullen’s sister — who authorities said had children with Mr. Smith and gave birth to a heroin-addicted baby last year — was also involved in the ring. Investigators believe that Mr. Vicente was selling to other dealers in the New York City area. None of those involved in the ring had “legitimate” jobs, Mr. Spota said. Mr. Vicente’s attorney, Lance Lazzaro, said at his client’s arraignment that prosecutors would have to prove there was a conspiracy to distribute the heroin into Suffolk, claiming the other charges — including the top felony charge of operating as a major trafficker (an A1 felony) — would be outside Suffolk’s jurisdiction. “If they can’t prove the conspiracy, the A1 felony goes away,” Mr. Lazzaro told a county judge. Ms. Cleary faces five felony charges of conspiracy, drugs sale and possession for her alleged role as a dealer in an operation that sold $160,000 worth of heroin in a 38-day period while investigators watched, Mr. Spota said. Ms. Cleary has been convicted once before of felony drugs sales, Mr. Spota said. She was scheduled to be arraigned in county court on the felony charges Wednesday afternoon.